Do you like corn fritters? I love them. I remember my mom making them when I was a kid. What’s not to love about these little round puffs filled with sweet corn, drizzled with maple syrup or a sprinkling of confectioners’ sugar or spread with a bit of jam for a very yummy breakfast, side dish or snack. If you want to get all fancy, dip in your favorite sauce or top with a salsa and serve as an appetizer. I think they are perfect little gems! 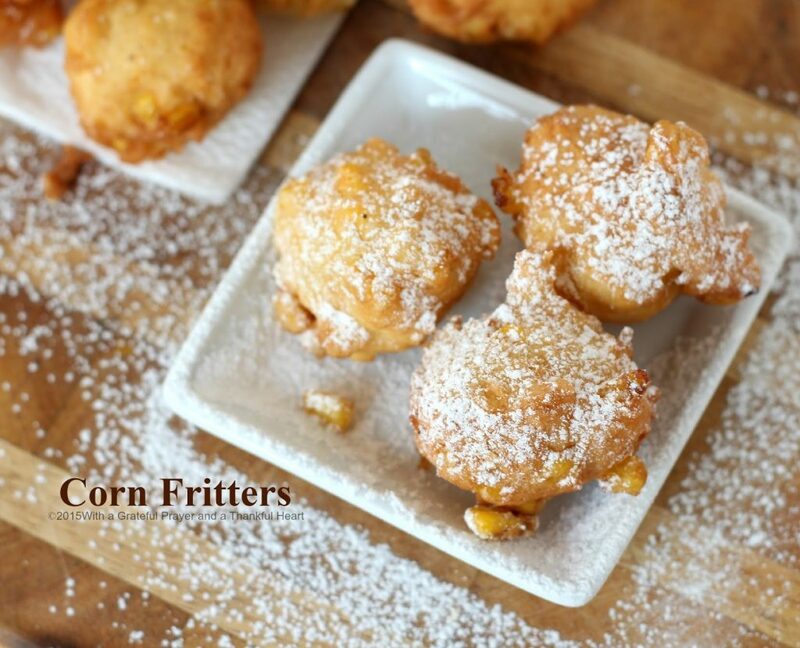 I love this recipe because the fritters puff up nice and big, taste great and are not greasy. Frying Note: Since I rarely fry foods and because I didn’t want to use a large amount of oil, I filled my smallest pot with oil about 3/4’s full. The pot is just over 2.75-inches tall and 4.5-inches wide so I could fry just two fritters at a time. Yes, it took a while to fry the whole batch but each fritter came out of the oil perfectly golden brown, cooked through and not greasy. Three minutes each batch, flipping halfway with a fork or slotted spoon and then on to paper towels to drain. 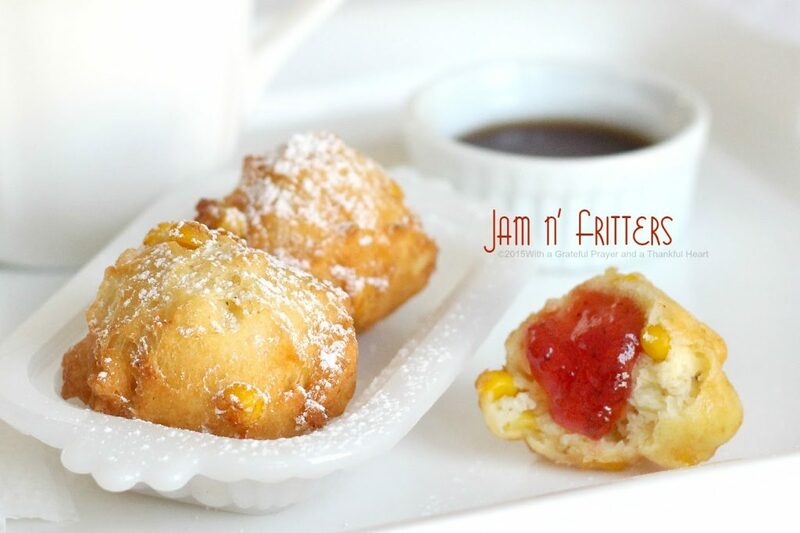 Jam n’ Fritters… sounds like a rock band. I’ll keep that in mind should I ever become a star! Combine the flour, baking powder, salt, pepper and sugar in a medium bow, whisking well to blend ingredients. 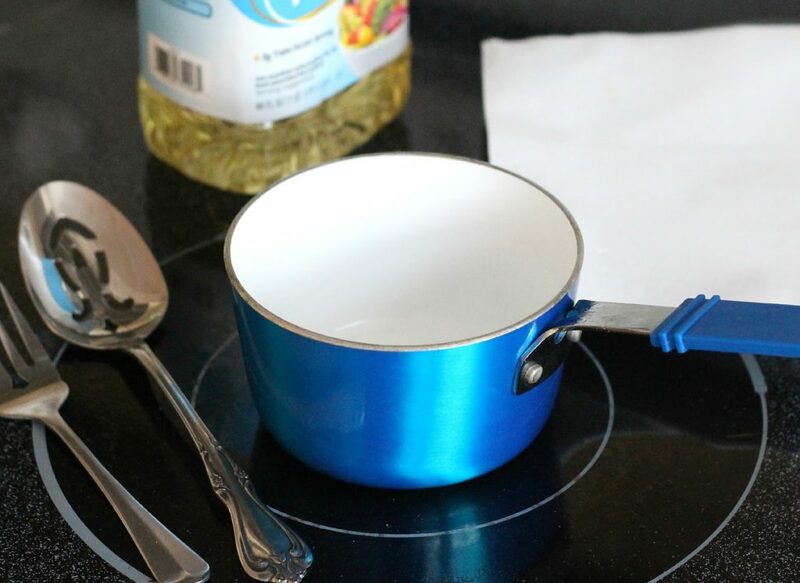 In a mixing bowl, beat the eggs with a rotary beater until light. Add the milk and melted butter; blend. Stir in the corn and mix thoroughly. Add the dry ingredients to the egg mixture and stir just until moistened. Heat 2-inches of oil in a skillet to 350 degrees. Drop the batter into the oil by rounded teaspoonfuls (I used a small cookie scoop. Don’t make scoops too big or the inside won’t cook through); fry about 3 minutes, flipping halfway, until nicely browned. Drain on paper towel. Sprinkle with confectioners sugar and serve with maple syrup. These look fabulous, Lorraine! I can't remember when I last ate a corn fritter now I want some..real bad! Also, thank you for your kind comment about losing Hunter. Have a blessed day! All I do know at this minute, is that there are way too many miles between your house and mine! 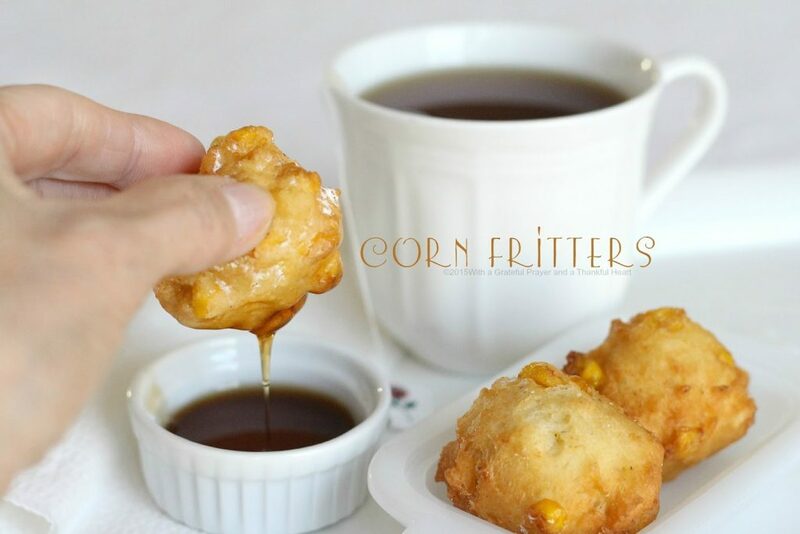 I can hardly stand looking at your "corn fritter" pictures, and reading about them, with my hot cup of coffee in my hand. I love corn fritters and forget all about them, until of course, I am reminded of them in such a beautiful way! Thanks for sharing, for making it look easy, and for another walk for me, down memory lane. 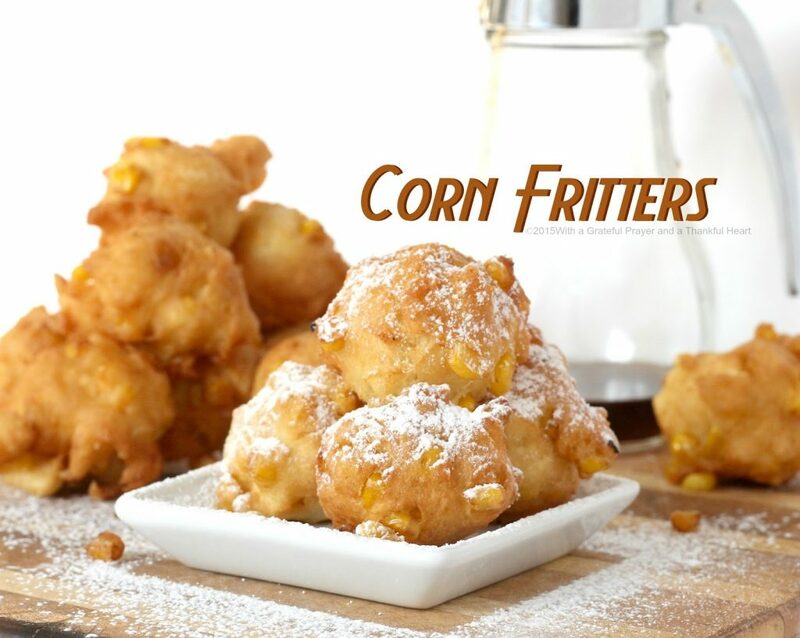 Corn fritters are one of my favorites. I grew up on them, fed them to our kids, grandkids and make them pretty often. We always put butter on ours and have never heard of syrup or powdered sugar used on them….it must be delicious. I am going to make these for my bunco group next month and I think they will love me forever and ever. 🙂 Maybe with a good little dip of some sort….. Yes mom use to make them…but I have never heard of having them with icing sugar and maple syrup!! Sounds wonderful!! I have not tasted these before. They look delicious! Oh my goodness! Anything you make looks delicious including these fritters! Never made them, but they sure look good!! Oh my goodness, I love those! Trouble is, I am afraid to deep fry for fear of things catching fire. I can be s uch a chicken at times. Now, I am going to try a recipe for corn cakes soon as I get some polenta.